Do Russians Have a Sweet Tooth? Russians do indeed have a sweet tooth. One of the reason behind that could be our climate. Sweets are high in calories. People who live in cold climate tend to consume more of the sweet food that can be metabolized in energy quickly. In addition to that – lack of sun in winter affects the mood, and sugar and chocolate are instant mood boosters. Russians especially love cakes. In Soviet time a selection of cakes in stores was limited. At that time cakes were sold in Kulinariya (deli – prepared food stores). In a typical Kulinariya, around the corner, one could find 2 or 3 types of cakes and 2-3 types of small cakes. 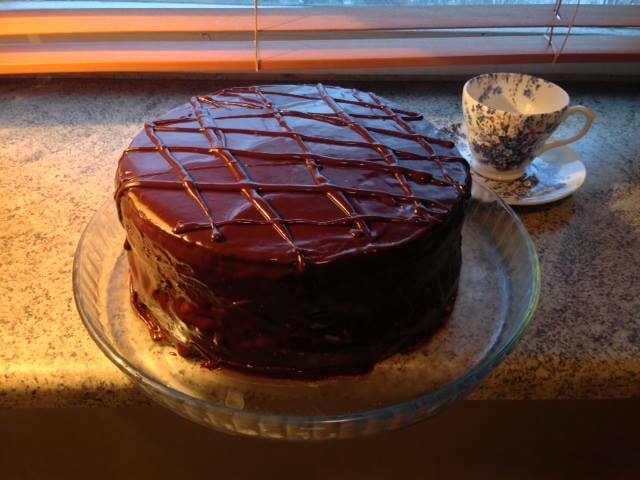 A very popular one was Praga – quite a tasty chocolate cake made of biscuit with butter based cream filling and chocolate glaze. 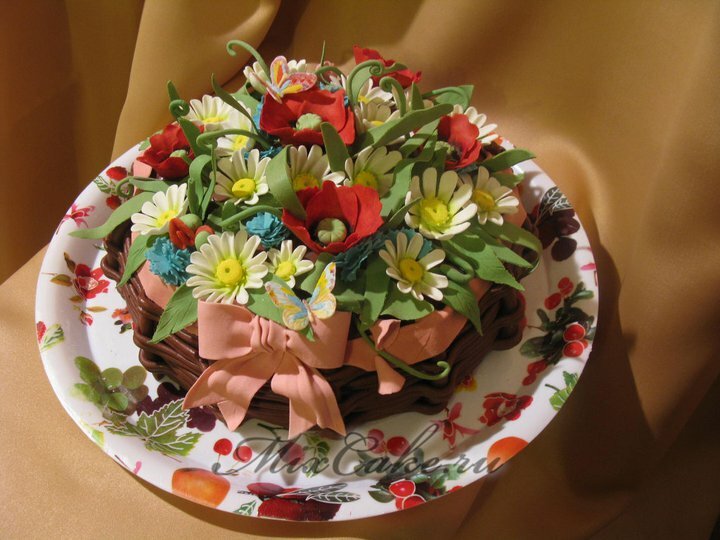 Another cake was Leningradsky tort – a short crust pastry with butter based cream as a middle layer and decorations made of cream and chocolates. 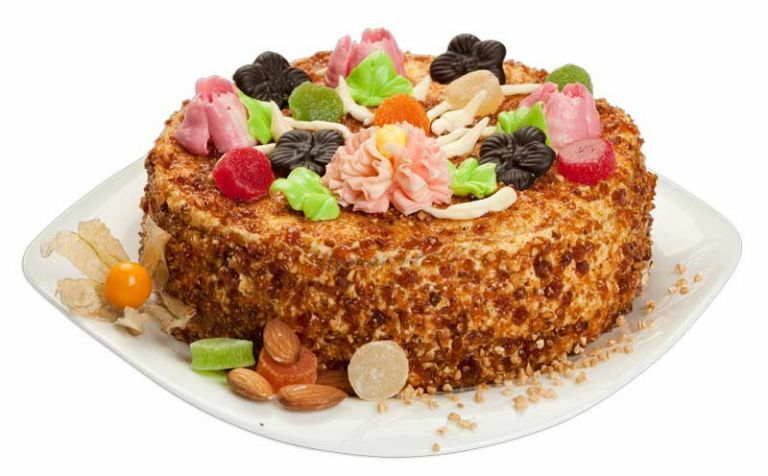 Another, less popular but usually present in stores, cake was Vatslavsky tort – biscuit dough, butter based cream, decorated with nuts and one dried fruit of unknown origin on the top. Once I had a severe food poisoning from eating the dried fruit (it was given to me as a treat since I was a child). Small cakes usually included Eklery (puff pastry filed with butter based cream, covered by sugar glaze) or Oreshki (puff pastry with custard, sugar glazing and nuts on the top), almond cookies and short crust pastry filled with egg white cream and jam. 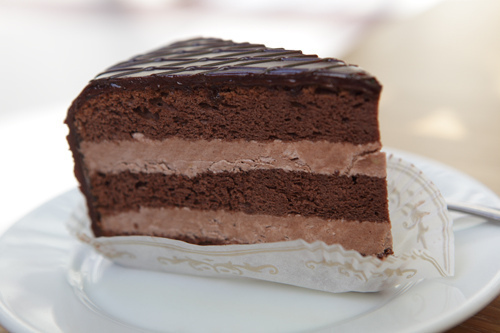 Big cakes cost 3 Rubles and small cakes cost 15-20 kopecks in the 80s (average salary was 120 rubles). 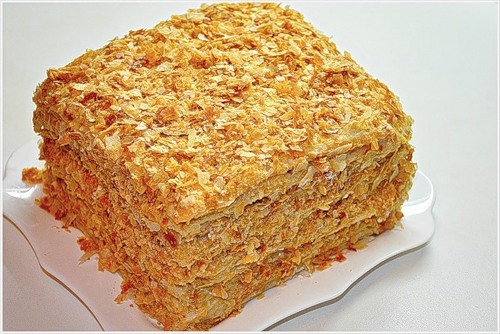 Soviet cake industry was capable of producing more cakes, but it was not easy to buy the most popular ones, such as Polet (cake made of meringue and cream or Napoleon (layers of puff pastry and custard). And the most sought after cake was Ptichye Moloko (Bird’s milk) – a very light soufflé style cake with just a thin layer of biscuit at the bottom and chocolate glazing on the top. Bird’s milk is something that does not exist, something that exists only in fairy tales. Similar to that – the Bird’s milk cake was a rare guest at people’s dinner tables. As for other sweets that you could buy in stores – variety of biscuits was quite limited and biscuits were not very popular. Best chocolate sweets were difficult to find, they were “in deficit”. Deficit foods were distributed in “zakazy”. Direct translation of Zakazy is orders or requests. But you could not just request chocolate sweets – they were given to a small part of population prior to big holidays (New Year, Revolution day, Victory day etc). My grandparents received chocolate sweets in Zakazy but the quantity was always limited. Btw, typical Zakaz contained chocolates, salami, shproty (canned smoked fish), buckwheat, canned peas, mayonnaise, butter and tasty marmalade in metal tins. Since there were not many cakes and sweets in stores – Russian women of all ages baked wonderful cakes and desserts at home. It was like a sport and recipes were exchanged among close friends and relatives. Russian people did not have a habit of going out for coffee and cake at that time since there was also a scarcity of cafes. Therefore, cakes and other sweets were mostly for home consumption with tea in the evening after dinner. Most women born in the 50s-80s can also bake a Napoleon cake from scratch (18 layers of dough and custard cream between layers) and have 30-50 other recipes of sweet stuff in little handwritten books in their kitchens. One of the cakes that I still bake from time to time is called Drunken Cherry. It takes 5 hours to bake it and 3 days for preparation. You take frozen cherries (also difficult to find in Soviet time, in Moscow there was just one store called Morozko (Father Frost), where you could get them). You soak cherries in vodka for 3 days and then you bake a miracle. Guests always wonder how you achieved putting fresh vodka-soaked cherries inside the pie – the trick is to cut the pie in half horizontally while it is still hot, scrambling the pie content out, mixing it with cherries and filling the new mix back in. 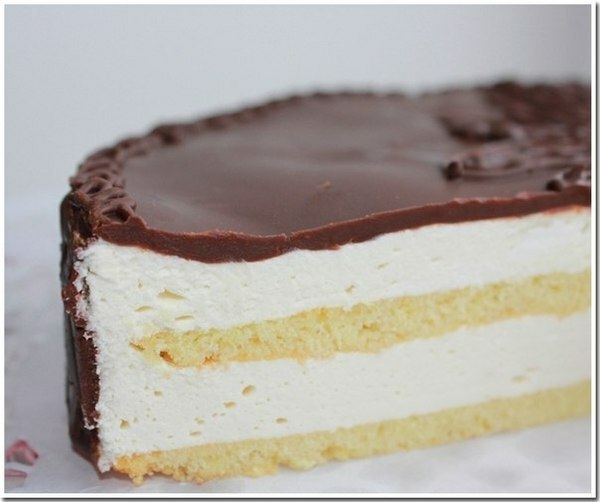 After that you assemble the cake as usual, put the cream layer inside and glaze the cake. 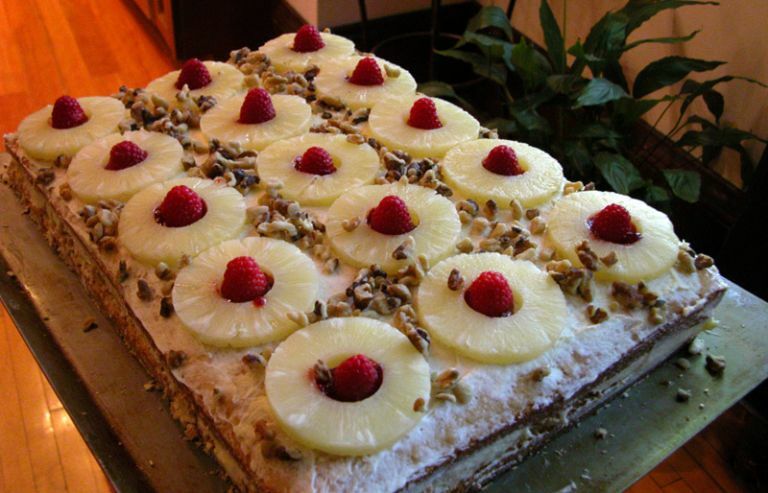 I also bake a pineapple cake – very tasty biscuit base, filled with meringue, raspberry jam, butter cream and decorated with canned pineapple slices, cashew nuts, raspberry jam and meringue on top. Needless to say – when market economy came to Russia and cakes became ubiquitous in stores – Russian consumers loved that. Now it is possible to buy anything – from old-fashioned traditional cakes to cakes with exotic fruit, low-calorie cakes, fancy looking cakes. Ready-made cakes save a lot of time for women every year. However sometimes I think that it is a pity that 20-year-old girls now do not have a clue about baking any more. And those recipes are sitting in the kitchen cabinets and collecting dust. Do you bake cakes at home? ← What Are Dos and Don’ts in Russian Business Meetings? 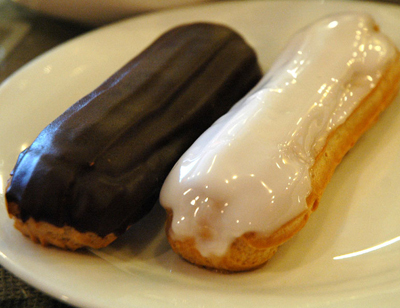 Is there a notable difference between Russian men and women’s preference to sweets? Great question George! 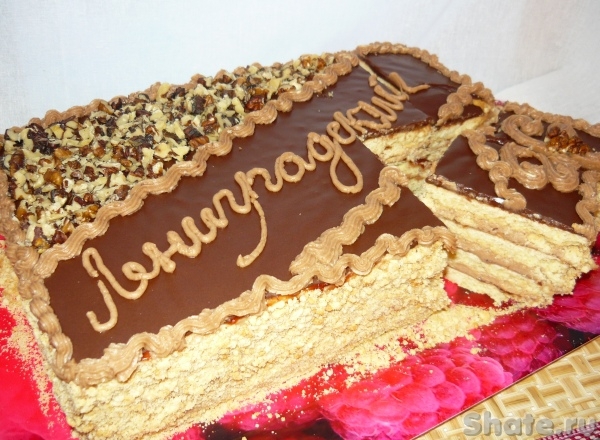 I do not have the stats, but from what I see both men and women in Russia love cakes and other sweets. Women do eat chocolate more often than men though. What a lovely post! Tanya your blog is beautiful and such a lovely collection of stories and anecdotes about a country we in the US still know so little about. I recently read Mastering the Art of Soviet Cooking and found it truly fascinating both for the descriptions of unusual food (something straight out of a fairy tale in some instances!) and tales of the Soviet state. What a lovely book and how great to find a blog that talks about Russia from an “everyday” perspective. Hi Kerry! Thank you so much for such warm words! Please do not hesitate to ask me about anything, including recipes! Could you post the recipes for all those cakes? They look marvellous! !